Dubai, UAE – March 20, 2019: At HP Reinvent, the company’s largest global partner event, HP Inc. unveiled a variety of bold new offerings – including a ground-breaking security service, a cutting-edge commercial virtual reality (VR) headset, and stunning consumer and commercial PCs – all designed to transform experiences across work and life. The security landscape continues to evolve, with endpoints being one of the most common attack vectors, and 64 percent of companies experiencing a significant breach via an endpoint in the last year alone . HP is taking the lead in addressing these endpoint security challenges, unveiling a new security-focused managed service designed to enforce policies, actively monitor, proactively respond, and defend against the threat of undetected attacks. HP DaaS Proactive Security Service, a significant extension to HP’s award-winning device as a service offering, is designed to go beyond anti-virus solutions and provide a critical extra layer of defence. As the world’s most advanced isolation security service for files and browsing on Windows 10 PCs , HP DaaS Proactive Security Service extends protection and security intelligence to transform endpoints from your biggest risk to your best defence. HP DaaS Proactive Security provides real-time malware protection for computing endpoints and threat analytics through HP TechPulse. Additionally, specialised Service Experts are available to enforce endpoint protection compliance and provide insights with detailed kill chain analysis to IT teams. In the U.S, the service also includes a security self-assessment tool and scorecard, and cyber security solutions including assessment, incident response and cyberinsurance services from Aon , a leading global professional services firm. HP has joined forces with Aon in the U.S to bring complete security solutions to commercial organisations that span assessment, endpoint security, and breach response and cyberinsurance. This combination of security as a service and professional services from Aon provides the most complete, tightly integrated service experience for customers. SMBs are passionate about their business, and having technology that helps them save time and grow their business is paramount. They seek durability and value. With nearly half of all SMBs still running Windows 7 , now is the time for growing businesses to begin the switch to a powerful new Windows 10 machine that securely unlocks the performance that gets the job done both in and outside the office. 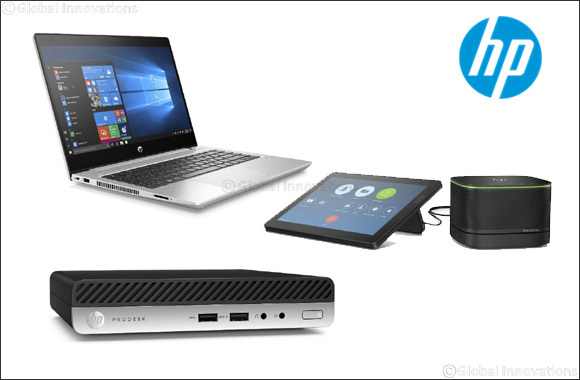 Designed for the modern SMB workforce, HP has expanded its AMD commercial portfolio with the addition of the HP ProBook 445R G6, HP ProBook 455R G6, and the HP ProDesk 405 G4 Desktop Mini. Powered by 2nd Generation AMD Ryzen™ mobile processors, the HP ProBook 445R G6 and HP ProBook 455R G6 help professionals stay productive in the office and on the go. The new notebooks adopt the elegant design concept found across the HP EliteBook portfolio, featuring an ultra-slim aluminum chassis with crisp lines, clean edges and undergoes 9 MIL-STD tests for durability. The 180-degree hinge allows users to lay the devices flat, making it easier to share content and collaborate, while HP Noise Cancellation reduces background noise by up to 20dB , providing a robust audio and video conferencing experience. The HP ProDesk 405 G4 Desktop Mini delivers the performance, expandability, and security that SMBs need in a compact and stylish design. The PC is the company’s first 400-series desktop mini, featuring a 2nd Generation AMD Ryzen™ PRO processor with built-in Radeon™ Vega graphics and can support up to three displays , serving a new market of customers who need a powerful system to create content coupled with the advanced security and manageability capabilities of the AMD processor. Today’s workforce prefers in-person meetings more than previous generations. Eighty-four percent of Gen Z workers prefer in-person communication and consider virtual solutions including Skype and Zoom, as a way to meet face-to-face with colleagues . Today, HP announced HP’s Zoom Room solutions to make it easier for IT decision makers to choose a conferencing and collaboration solution that best meets the needs of their organisation. HP Zoom Rooms Solutions provide easy, customisable, and flexible meeting room options that are secure and manageable to small, medium, and large organisations. By providing the world’s most versatile collaboration solutions , with HP Elite Slice for Skype and Zoom, HP makes it easier for workers to seamlessly communicate both in and outside of the office. HP also announced HP Premier Care Solutions to enhance its premium commercial notebooks, including HP EliteBooks and HP ZBooks. These set of must-have services provide the right protection, support, and service levels to maximise user productivity. Consumers want devices that integrate into their life and reflect who they are. Fifty-seven percent of millennials know the PC they want as soon as they see it , and 82 percent of this group consider the PC as a critical part of their life . Taking refined craftsmanship and performance cues from the HP Spectre premium portfolio, the new line-up of HP ENVY laptops and x360s features HP Command Center for powerful performance, sophisticated design with a geometric pattern for audio and thermal venting, and robust security – including a biometric fingerprint reader, a privacy camera kill switch, and optional HP Sure View privacy screen to ensure screen content isn’t exposed. Built with mobility in mind, the HP ENVY 13 Laptop features the latest Intel processors to power up to 19 hours of battery life (nearly a 41 percent improvement versus the previous generation). The new HP ENYY x360 13 features a powerful 2nd Gen AMD Ryzen™ processor and up to 14.5 hours of battery life15 in a convertible form factor. HP ENVY x360 15 offers versatility with either an AMD or the latest 8th Gen Intel® Core™ processor , with up to 13 hours of battery life15, a 28 percent top-bezel reduction versus the previous generation, and an optional AMOLED display for stunning colors and brightness for browsing or streaming video. The HP ENVY 17 Laptop is built for performance with an 8th gen Intel® Core™ processor and NVIDIA® GeForce® MX250 graphics for productivity, creativity, and entertainment. The 17-inch device offers a better screen-to-body ratio for a more immersive viewing experience, thanks to the 45 percent top bezel reduction versus the previous generation. HP DaaS Proactive Security Service will be available across EMEA in April 2019. The Proactive Security service with Aon offerings will be available in the US in April 2019, with additional geographies to be added later this year. The HP ProBook 445R G6 and HP ProBook 455R G6 is expected to be available in EMEA in May, starting at €499. The HP ProDesk 405 G4 Desktop Mini is expected to be available in EMEA in May, starting at €389. The HP Zoom Rooms Solutions are expected to be available in EMEA in August. Pricing will be confirmed closer to availability. HP Premier Care Solutions are offered in three packages. The Essential Care package is available now. The Expanded Care and Enhanced Care packages are expected to be available in EMEA in the second half of 2019. The HP ENVY 13 Laptop is expected to be available in EMEA in April, starting at €899. The HP ENVY x360 13 is expected to be available in EMEA in April, starting at €749. The HP ENVY x360 15 with Intel processors is expected to be available in EMEA in June, starting at €899. The HP ENVY x360 15 with AMD processors is expected to be available in EMEA in May, starting at €799. The HP ENVY 17 Laptop is expected to be available in EMEA in April, starting at €999.